The Solar Green Eternal Light Project is one aspect of the larger Green Sanctuaries Program that focuses on energy. The project looks at the overall needs of an institution through energy audits and retrofits and also works on specific solar vendor contracts through the Green Bulk Purchasing Program. Through Solar Eternal Light, we also work on local, state, and federal regulatory issues to address difficulties that our institutions face in acquiring and making use of solar energy. The Solar Eternal Light Project also generates grass roots community awareness and diverse media coverage. 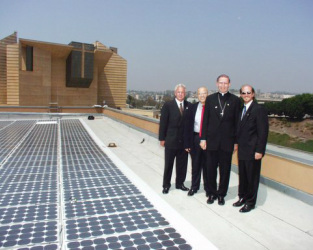 Faith institutions on which solar panels are installed hold events that commemorate each project milestone. Each of these events is an opportunity to generate awareness among members and garner community support for solar power and environmental programs.